We live in times when fact and propaganda are all too easily—and often deliberately—conflated. I recall, a long time ago, sitting in my public high school's Advanced Placement US History course, when the instructor explicitly mentioned "lack of government regulation" as one of the causes of the Great Depression. The odd aspect was that he prefaced this explanation with an explicit warning to me that I would not like what he was about to say. It was as if he knew that he was presenting an ideologically charged position as fact—and he did it anyway, because, in his mind, no other interpretation of the Great Depression was possible. He and millions like him would benefit immensely from reading Robert P. Murphy's The Politically Incorrect Guide to the Great Depression and the New Deal. The myth of the Great Depression being caused by laissez-faire capitalism—and being solved by either the New Deal, World War II, or both—is so prevalent that in popular-opinion surveys, Franklin Delano Roosevelt routinely appears in the top five of all US presidents, while the name of Herbert Hoover has become synonymous with government inaction during an economic crisis. Hundreds of books, essays, and even works of fiction have been published to challenge these notions—but somehow the fallacies have prevailed; and they have been eagerly exploited by the would-be FDRs of the past seven decades. For millions of Americans who have not studied Austrian economics and the Mises/Hayek theory of the business cycle, or read the brilliant critiques of the New Deal by H. L. Mencken, Isabel Paterson, Albert Jay Nock, Garet Garrett, and John T. Flynn, the commonplace myth of laissez-faire as ruinous and FDR as savior appears true, self-evident, and incontestable. Unfortunately, many of these same people vote for politicians and policies that promise a "New New Deal." Such a plan would further exacerbate the current economic crisis, which is fueled by hyperregulation, Federal Reserve manipulation of the money supply, and the unforeseen consequences of prior interventions, including the original New Deal. Murphy's work seeks to correct popular misunderstandings of the Great Depression by attacking them directly. Virtually every single commonly encountered assertion—that the Depression was caused by the excesses of capitalism, that Hoover exacerbated the Depression by "doing nothing," that the New Deal revitalized economic activity and mitigated unemployment, and that World War II energized the United States into recovery—is refuted at length. In the course of this debunking, the reader is treated to concise, elegant explanations of the Austrian theory of the business cycle, the economics of tax reduction, the virtues of the gold standard and the dangers of fiat currencies, and to discussions of the errors both in Keynesian prescriptions for deficit spending and in the Chicago School's suggestion that the Federal Reserve triggered the Great Depression by failing to inflate sufficiently. To add flavor to the book and enable readers to identify with more concrete aspects of the policies it criticizes, Murphy discusses many of the follies and corruptions of the New Deal: FDR's use of "lucky numbers" to set the price of gold, the persecution of the Schechter brothers for defying the National Recovery Administration's restrictions on poultry production, FDR's attempt to pack the Supreme Court with his supporters after the court ruled in favor of the Schechter brothers, the confiscation of private citizens' gold holdings, and the New Dealers' pervasive use of government funding to bribe and intimidate constituencies into supporting FDR's policies. "If there is any hope for an intellectual rejection of New Deal ideology in the United States, Murphy's book will be one of the crucial elements motivating it." Murphy skillfully reminds us that the politicians who seek to suppress our economic and political liberties in favor of a central plan are neither omniscient nor benevolent; they quite frequently pull policy prescriptions out of thin air and they are anything but evenhanded, tolerant, or concerned for objective human wellbeing. Behind the lofty rhetoric and faux amiability of men like FDR stands the harsh, impatient, implacable, and often indiscriminate enforcer, in the mold of those thugs who broke into peaceful men's homes to ensure that they were not violating the National Industrial Recovery Act by sewing clothes at night. If there is any hope for an intellectual rejection of New Deal ideology in the United States, Murphy's book will be one of the crucial elements motivating it. Murphy bridges the gulf between high theory and the concerns accessible to the majority of readers. While it is unfortunate that, given the state of education in our time, most Americans would not be able to immunize themselves against common economic fallacies by directly reading Menger, Mises, Hayek, and Rothbard, Murphy helps bring some of the key ideas of these thinkers into a format more accessible to a layman with no formal economic training. Murphy also incorporates the work of such historians as Burton Folsom and Paul Johnson, and he draws on biographical information to shed light on the lives, motivations, and personalities of Calvin Coolidge, Herbert Hoover, and other key figures of the 1920s and 1930s. Murphy does for the popular understanding of the Great Depression in the early 21st century what Frederic Bastiat did for free trade in the mid-19th and what Leonard Read and Henry Hazlitt did for basic economic principles in the 20th. I am a former student of Murphy, and I can credit his instruction for enabling me to advance from a basic understanding of Austrian economics to the publication of a paper in the Quarterly Journal of Austrian Economics. From personal experience, I know him to be well-read, cosmopolitan, sophisticated, and capable of articulating the arguments—and recognizing the strengths and weaknesses—of an immense variety of theories and worldviews. At the same time, he possesses a talent for communicating complex and challenging ideas, connecting them to concrete phenomena, and even joking about them. As such, he is eminently suited to bringing some of the most important economic and historical insights of the 20th century to a mass audience. Indeed, it might reasonably be hoped that thousands of readers of this book will use it as a gateway to discovering the works of the many free-market thinkers cited therein. The lists of suggested readings ("Books You're Not Supposed to Read") peppered throughout the text make it a worthwhile purchase by themselves. 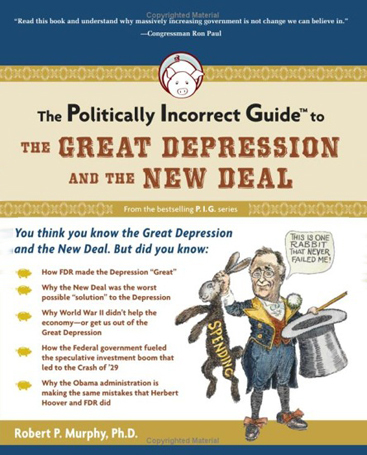 Perhaps someday my old US history teacher, and men like him, will use The Politically Incorrect Guide to the Great Depression and the New Deal in their courses to balance the many explicitly pro-New Deal and prointerventionist texts and presentations that dominate public-school curricula today. If this is too much to hope for, then at least this book has the potential to appeal to many young students and be sought out by them on their own initiative—as an antidote to the fallacies they encounter from "mainstream" sources.